Morning in the kitchen, taking a Spanish cooking class. Lunch based on the prepared dishes, accompanied by Rioja wine. Description: If you are interested in learning how to prepare traditional Spanish dishes but do not have too much time to dedicate to it, consider a morning in the kitchen, followed by a three course lunch. 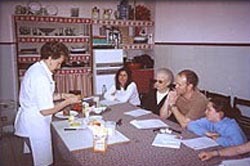 With the assistance of a professional cooking teacher, this tour will help you prepare a complete menu based on regional Spanish recipes - two main dishes and dessert, during a 2 and a half hours hands-on cooking class in English, followed by lunch based on the prepared dishes, accompanied by wine. Learn the original recipes of classic Spanish dishes such as stuffed piquillo peppers, potatos "a la importancia" with clams, marinated tuna, paella, etc. After this cooking session, you will be ready to prepare a complete and authentic Spanish menu. Your teacher, is a prestigious cooking professional with 15 years experience as instructor at one of the best cooking schools in Madrid, "Juan de Altamiras". She was born in Madrid and is member of the Spanish Academy of Gastronomy. She has worked for the Culinary Institute of America and many other culinary organizations both in Spain and abroad. The lessons take place in a private small professional kitchen, perfectly equipped, very well located, right in the center of the old Madrid, close to the Palacio Real and Opera square - a very nice area to go for a walk after lunch, in case you feel like it. With the assistance of our cook you will prepare a complete menu, based on seasonal availability of ingredients, including a dessert, of course. Lunch of the prepared recipes will follow, including D.O. Rioja wine, one of the classic Spanish wines.- a mouth-watering experience! Please use the links to the left for information about the many excursions and daytrips available to you from Spain's capìtal, and around the country.